A tipi-shaped hideaway perfect for your feathered friend! This tipi is fixed inside the cage by means of a snap hook. Large windows on each side to go in and out as many times as wanted. Inside, a velcro strap to place your companion's favorite toys. 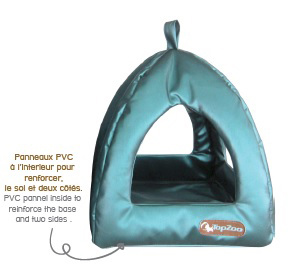 Sturdy and stable, an ideal place to nap in all safety! A little paradise on Earth for all birds in general: parakeets, parrots, ... Available in 2 colors: blue and green. Easy to care for, entirely machine washable cold cycle.